BMW E71 X6 M Black beauty We showcase a BMW E71 X6 M Hamann Widebody with Schmiedmann turbo kit – it’s quite a beast! Hamann Widebody with Schmiedmann turbo kit. The BMW X6 M has always been a wild combination of an SUV; a car that offers the appeal of a coupé plus the 4.4-litre V8 S63 engine. Producing 556.9hp, it’s a monstrous, all-wheel-driving beast of pure power. However, there are those who believe that the car’s standard specification leaves plenty to be desired, and that its full potential has yet to be reached. 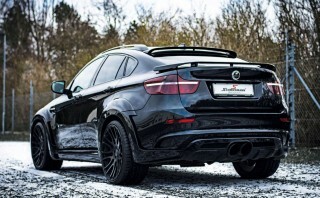 And to emphasise that point, here’s the X6 M Hamann. This formidable machine currently rests in the workshop of Danish BMW & MINI parts specialist Schmiedmann, where it’s the centre of constant attention. The car’s massive physical presence is impossible to ignore, and demands attention from the many customers who get drawn to it. 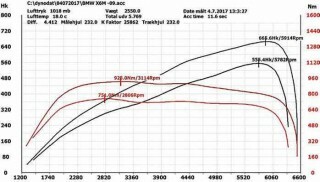 It’s not long ago that Schmiedmann installed the brand new Schmiedmann Signature Stage 2 Turbo Kit by Turbo.dk, and now the car waits to be tested on the dyno/rolling road. Schmiedmann is confident that the modification will push the engine’s power output to more than 700hp, but the precise number will have to wait for the dyno test results. The story of this particular X6 M is an unusual one. It begins in Russia, where the car’s first owner set out to make his E71 look more imposing and aggressive. He turned to German tuning specialist Hamann, and engaged them to start working their magic. The X6 M was fitted with the Tycoon EVO2 M 2-LED spoiler kit, a roof spoiler and a sports rear silencer with two central tailpipes. The new exhaust makes a tremendous difference, producing a loud and deep rumble that leaves people in no doubt about the car’s performance potential. When accelerating, the true beast is unleashed with a violent roar that simply shreds the air. The car now runs on beautiful Unique Forged Anodised VA 11.0x23 and HA 12.0x23 rims, also from Hamann, which add significantly to the exterior drama. As finishing touches, Hamann added to the fine detail by fitting their emblems and floor mats etc. 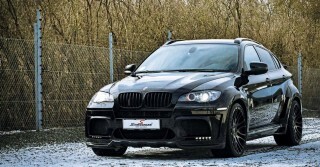 Thanks to the upgraded exterior, the X6 M became a BMW E71 X6 M Hamann Widebody, and thoughts then turned to the interior. 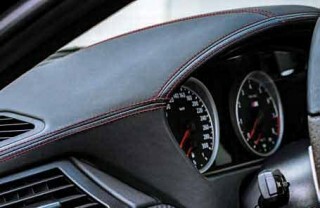 The Russian owner had the cabin clad in black leather with contrasting, red stitching. Then, jumping ahead a few years to 2015, a Danish carpenter was searching for a BMW X5 for his wife to use, when he stumbled across the X6 M. It wasn’t a model he was familiar with, but he loved what he found and engaged a specialist dealer to source him an example to buy. It wasn’t long before Bo got a call from the dealer, with the news that they’d unearthed a very special BMW E71 X6 M Hamann Widebody, which was for sale in Düsseldorf. The car seemed a perfect fit and the purchase was arranged in double-quick time. With the X6 M Hamann was in his drive, Bo felt he was close to having the perfect car, especially when it came to the styling. With 556.9hp (and 751Nm of torque), it was far from a boring car to begin with, but Bo wanted to extract a little more from the package so that he could be really satisfied. In 2016, the car was sent to Schmiedmann where it was fitted with the Signature Stage 1 Turbo Kit by Tyrbo.dk, a move which boosted the engine’s power output to 665.6hp, and increased torque to a stonking 925Nm! However, despite that impressive increase in power, it wasn’t long before Bo was hankering after more, so the car was returned to Schmiedmann once again for further engine enhancements. This time, the newly-developed Schmiedmann Signature Stage 2 Turbo Kit by Turbo.dk was fitted, increasing power to the fun side of 700hp! We’ll have to wait to find out just how much of an increase has been achieved, and whether or not Bo is satisfied with the results. Schmiedmann is confident that the modification will push the engine’s power output to more than 700hp. Exterior changes have produced a car with immense road presence. With upwards of 700hp under the bonnet, this Schmiedmann-modified X6 M will be some performer.